The first award of the night went to Sam Rockwell for best supporting actor for his role in "Three Billboards." Later in the evening, "Three Billboard's" Frances McDormand also won for best actress and used her speech to promote gender equality and lift up the women in the room. "If I may be so honored to have all the female nominees stand with me," she said. "All the filmmakers, the producers, the writers, the composers," she continued as more women stood up and applauded her. She continued, "Look around ... because we all have stories to tell." 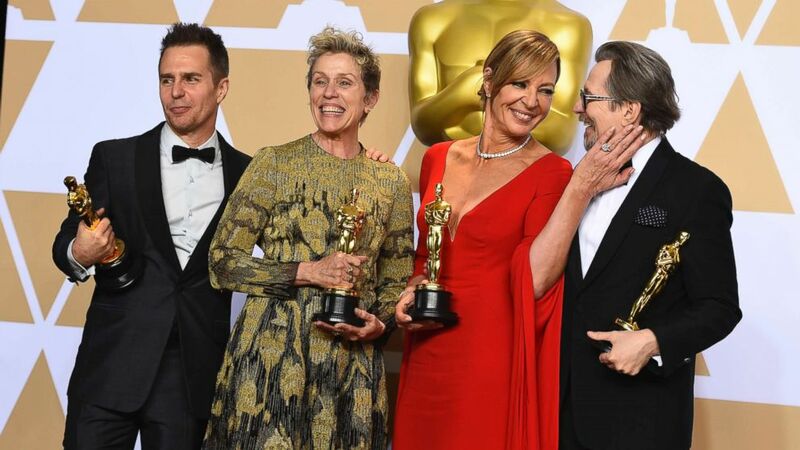 Allison Janney took home an Oscar of her own for best supporting actress for her role in "I, Tonya" and joked in her speech, "I did it all by myself." She also thanked her castmates and even the bird that was used in the film as her funny companion. Toward the end of the night, Gary Oldman won best actor for his portrayal of Winston Churchill in "Darkest Hour." "I owe this and so much more to so many," he said, struggling to get out the words to describe the moment. "The movies, such as their power, captivated a young man from south London and gave him a dream," he said about his past. When it came down to the big award for best picture, that went to "The Shape of Water." It was the second award for Guillermo del Toro, who also won for best director.